I think I left my comment in the wrong place yesterday. My comment was about how art counted for a little boy in the DFW airport. I have been trying to get back to that page but evidently I am blog-challenged. I am trying to find my way back to the comment page. Still can't figure this thing out, go figure..
Christy - it's a terrific song & I AM gonna be a stronger woman, BUT . . . unlike the guy in Jewel's song, MY guy is a keeper!! Talk to ya later & it IS almost April! 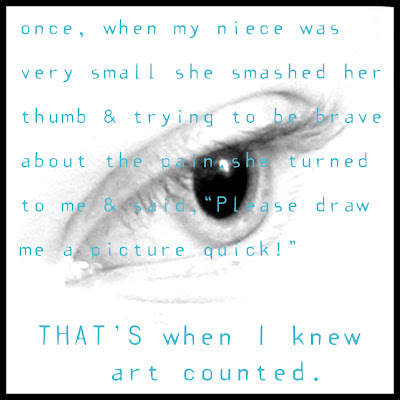 Dr. Love - I related your story to the Art Counts, so it made sense to me. Good luck on figuring the blog thing out. It took me a while!